The importance of chirality in molecular recognition processes and the biological activity of many chiral pharmaceutical drugs and agrochemicals is nowadays well accepted and there is a continuous need for synthetic methods leading to single or enriched enantiomers. Chiral compounds also find application in the development of specific sensors for biological molecules and new materials with peculiar properties related with ordered spatial arrangements. Hystorically, nature has been the main source of chirality and many synthetic processes relied on compounds from ''chiral pool'' as starting materials, resolving agents for the separation of enantiomers from their racemate, or chiral auxiliaries in diastereoselective synthesis. In the last 20 years asymmetric catalytic reactions, based on the ability of non natural chiral compounds in sub-stoichiometric loading to promote the synthesis of a single enantiomer in large amount through selective chiral multiplication effect, have became largely predominant exerting a tremendous impact on the production of chiral compounds from achiral molecules. The relevance of this approach has been acknowledged by the Nobel prize awarded to Sharpless, Noyori and Knowles for their fundamental research in this field. Most catalysts are complexes of chiral ligands with transition metals and fine tuning of sterical and electronic properties of the ligands has provided in many cases high levels of stereoselectivity, even at very low catalyst loading, suitable for industrial scale-up. At the beginning of the 90s, the increased attention to the protection of human and environmental health led to the development of ''green chemistry'', which gives central emphasis to the design of new chemicals and processes aimed to reduce or eliminate the use and generation of hazardous substances. This goal could be achieved with a substantial modification of all the aspects of a chemical process from the more obvious use of renewable sources or waste minimisation to conceptual changes in synthetic reactions in order to maximize atom economy and limit derivatization steps whenever possible. Fundamental approaches of research in this field are well summarised in the ''twelve principles of Green chemistry'' and, in this context, catalysis is a milestone in that it is often compatible with the use of less toxic reagents, reduction in energy requirements, high productivity and simplification of separation procedures. Since the effects of chiral drugs or agrochemicals in most cases reside on a single enantiomer while the other is inactive or displays antagonist and/or adverse effects, there is an increasing demand of formulations containing stereochemically pure active ingredients that beneficially allow reduced total administered dose, enhanced therapeutic window or activity and suppression of the risks associated to the "inactive" enantiomer. In this context, asymmetric catalysis has gathered a key role in organic synthesis and much research has been focused on its advance in a more sustainable direction. Considerable efforts have been carried out for structural optimization of the catalysts, since asymmetric induction is directly related with their chemical, stereochemical, electronic and steric properties. In transition-metal catalysis, besides the most investigated C2-symmetrical ligands, unsymmetrically disubstituted or monodentate ligands and bifunctional catalysts have been also explored in conjunction with the use of less toxic and/or less expensive metals, leading to an expanded portfolio of effective asymmetric reactions today available. Simultaneously, the first report ten years ago of a proline-catalysed direct asymmetric aldol reaction opened the door to "organocatalysis" that has emerged as a powerful methodology, complementary to biocatalytic and metal-transition catalysis, with attractive features in high operational simplicity, low cost and toxicity of catalysts and the possibility to perform several reactions through different activation modes. In the search for more benign alternatives to organic solvents, many of which are volatile, flammable and harmful for human and environmental health, water, ionic liquids and fluorinated solvents have been largely investigated and biphasic liquid-liquid systems based on these non conventional reaction media have allowed the selective recover and recycle of chiral catalysts, providing that they were suitably labeled with ionic or fluorous substituents in order to increase their phase-affinity. In a complementary recycle strategy, a variety of active catalysts have been immobilized on macromolecular supports and recovered by solid-liquid separations. The productivity of some asymmetric reactions has been markedly improved through the application of microwave irradiation as non-conventional heating source or the development of continuous-flow reactors, which have provided more prolonged catalyst life, reduction of solvent waste and simplification of workup procedures. As concerns the design of new synthetic strategies, enantio-selective cascade reactions represent an emerging and exciting research field for their potential in the construction of complex molecules from simple precursors in a single process, thus avoiding the costly protection/ deprotection steps and purification of intermediates. Herein is presented a general overview of the approaches currently applied for "green" optimization of the different factors contributing to the overall efficiency of an asymmetric catalytic process together with selected examples taken from seminal references in the field and the past five-year literature. Rather than a comprehensive discussion of each argument this text offers a concise manual of the fundamental concepts with the aim to stimulate the interest of readers in new opportunities offered to chemists for synthetic buildup of stereochemical and molecular complexity, preserving at the same time human and environmental resources. Grateful thanks are due to Prof. Mario Piattelli for helpful suggestions and revision of manuscript, to Mr. Agatino Renda for technical assistance and to Dr.ssa Sonia Pedotti for continuous and fruitful research collaboration. Abstract The biological activity of chiral compounds is markedly affected by their chirality and there is a growing demand for the synthesis of such molecules in enantiopure form in order to limit and/or suppress adverse effects deriving from the use of the racemic mixtures. This tendency is in agreement with the objectives of ''green chemistry'', that gives a central emphasis to the protection of human and environmental health through the design of new chemicals and processes. Among the different methods for the preparation of optically active compounds, racemic resolutions can be improved by addition of racemization step to recycle the unwanted enantiomer or by using automated chromatographic methodologies. In stoichiometric asymmetric synthesis the use of chiral substrates or auxiliary groups allows to control the stereochemical outcome of several reactions through intramolecular transfer of chirality. Although these methodologies continue to be widely employed, asymmetric catalysis has emerged as more sustainable option and some processes have been yet applied at industrial level. of living processes occurs stereoselectively as a consequence of the fact that the chirality of a biological receptor can fit well only with a molecule having a specific spatial atomic disposition, according the called ''lock and key'' recognition mechanism. Therefore, chirality is an essential dimension in the earth's life and the origin of homochirality in biology is a continue subject of debate. According to a recent suggestion homochirality could be ultimately resulted from biased destruction of one enantiomer of the early amino acids, formed in comet dust, by means of the action of circularly polarised radiation that makes up 17% of stellar radiation [1,2]. The phenomen of optical self-purification by fractional sublimation has been also considered for a prebiotic origin of chirality . A complementary chemical theory has been proposed by Soai et al. on the basis of the finding that some chiral compounds, even with extremely low enantiomeric excess (ee) induced by a chiral initiator, are able to acts as chiral catalysts for their own production increasing significantly their optical purity during the reiteration of the process [4, 5]. Even the low ee (<2%) induced by the circularly polarised radiation in -helicene was proved sufficient for the activity of this compound as chiral initiator in a reaction of asymmetric autocatalysis with amplification of chirality . An evolution of chirality from the achiral nucleobase cytosine has been also suggested on the basis of its spontaneous crystallization into helically enantioenriched crystals shown to be active as chiral trigger for asymmetric autocatalysis . The stereoselectivity of biological processes implies that the pharmacological and agrochemical efficacy of drugs and pests often resides on one enantiomer, the other one being inactive or showing antagonist or adverse effects . In the early 1960s thalidomide, a chiral drug marketed as racemic mixture, began to be prescribed as sedative for pregnant women but the increase in the number of babies with malformations was soon related with the teratogenic activity of (S)-thalido-mide. Although thalidomide was banned in many countries, the case dramatically evidenced the need of more stringent rules for the evaluation of pharmacological activity and side-effects of a chiral drug. The actual regulatory guidelines  impose biological tests and pharmacokinetic analyses on separated enantiomers and there is a continuously growing need for the production and marketing of chiral drugs in enantiopure form  in order to gain better performances and limitation of risks. Other applications of chiral compounds range from flavours, fragrances and food additives to chiral materials, as polymers and liquid crystals, in which peculiar properties can be imparted by the presence of structurally asymmetric monomers or dopants [11, 12]. The widespread demand for chiral compounds in optically active form is in accordance with the increased attention to the minimization of human and ecological risks that at the beginning of 1990s has led to the development of the ''environmental sustainability'' concept as a new philosophy aimed to make the progress compatible with environmental well-being and savings of natural resources. In this context, the regulation of pollution and waste disposal, the search for alternative energies, the development of more degradable or recyclable materials have been recognised as imperative actions for the protection of the environmental and human health. These strategies have been also extended to chemical sciences and in 1991 the term ''green chemistry'' was coined to define the design of new chemicals and processes that reduce or eliminate the use and generation of hazardous substances. The different approaches to the development of more sustainable chemical production are well summarised in the ''twelve principles of Green chemistry'' [13, 14] according to which substantial modifications of all the aspects of a chemical process, from the more obvious use of renewable sources or waste minimisation to the more challenging design of novel reactions and simplification of the purification procedures, are greatly encouraged. The measure of the environmental acceptability of a given chemical process can be expressed by E factor (environmental factor) , defined as the mass ratio of waste to desired product, or by atom efficiency (or atom economy)  calculated from the ratio of molecular weight of the product to the sum of molecular weights of all the substances involved in the stoichiometric equation of the considered reaction. Whereas the atom efficiency is a theoretical number, for which a 100% chemical yield is assumed and all the substances that does not appear in the stoichiometric equation are ignored, the E factor gives a more realistic description of the chemical process since all the component of the reaction are taken into the account also including the solvent, the salts generated in the work-up and the excess of reagents. The comparative evaluation of environmental hazards and fate, cost and performances with respect to a currently used chemical process have been also considered in the U.S. EPA procedure for the assessment of cleaner technologies . In light of green chemistry principles intensive research has been devoted to development of efficient methods for the preparation of enantiopure compounds by improving the currently used processes in an evolutionary (short-medium term) approach or by introducing innovative concepts and solutions in a breakthrough (long-term) approach. The classical methods for the production of optically active compounds are usually grouped into three categories: (a) resolution of racemates, based on the differential interactions, either covalent or non-covalent, of each enantiomer in the racemic mixture with a chiral agent; (b) chemical modification of chiral pool; (c) asymmetric synthesis, in which the stereochemistry of new formed asymmetric carbons or other stereogenic elements can be controlled by the chirality of substrates, reagents or catalysts. In this section a short survey of all these methodologies is presented together with some selected examples of their applications. and chemical properties, from which the chiral reagent and the enantiomers are then recovered. The simplest racemic resolutions exploit the formation of diastereoisomeric salts with chiral acids or bases (Scheme 1.1) and the preferential crystallization of one of them. The search of the optimal chiral resolving agent, routinely carried out with a trial-and-error method, can be improved by a selection based on different criteria, as structurally analogy, thermodynamic data, use of additives , or by a combinatorial approach based on performing the resolution in the presence of a mixture of chiral compounds belonging to the same ''family of resolving agents'' . desired enantiomer is obtained. This approach has been applied in the Synthex resolution technology for the production of (S)-naproxen , one of the few antiinflammatory drugs in the family of arylpropionic acids marketed exclusively in optically active form (Scheme 1.2). In the extension of this method, especially useful for compounds with chemical functionalities other than acid and basic groups, the resolution can be achieved through the enantioselective complexation, driven by hydrogen bonds and other weak interactions, of a racemate with a suitable chiral host. Diastereoisomeric inclusion host-guest complexes are separated in many cases as crystals and synthetic hosts based on a variety of molecular scaffolds have been developed for the resolution of different classes of compounds. For example, some cholic acids have been reported as enantioselective receptors for sulphoxides, epoxides and lactams  whereas arylalkanols have been resolved by selective inclusion into supramolecular helical architectures constructed from pairs of organic achiral acid/ chiral diamines . 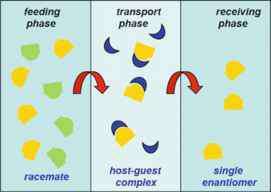 containing the racemate to a receiving phase through a transport phase containing a solution of the chiral host (Fig. 1.1). The selective extraction of N-acylated amino acids has been described using a solution in heptane of cinchona alkaloids kept in contact with two aqueous phases buffered at different pH values . Methods based on diastereoisomeric salts or complexes are preferred for the reversibility of the involved interactions that allow simple recover of the chiral reagent, but the conversion of enantiomers into diastereoisomeric derivatives by covalent reaction with a chiral auxiliary has been also considered in the racemate resolution. Enantiopure camphorsulphonic acids, phenylacetic acids, menthol or benzyl amines are easily available and widely used in the synthesis of diastereoisomeric esters and amides, whereas chiral v/c-diols as 2,3-butanediol are a popular choice for the resolution of ketones through ketalization. The diastereo-isomeric derivatives are usually purified by chromatography and the optically active antipodes of substrate are then recovered by removal of auxiliary group. Physical methods as ultrafiltration on chiral polymeric membranes are still limited to the resolution of few compounds, mainly amino acids, but this technique could be promising in the future for large-scale separations in conjunction with the development of novel and more selective membranes. More recent approaches deal with the immobilization of chiral ligands, as cyclodextrins and crown ether derivatives, or large biological macromolecules, as proteins or DNA, on natural and synthetic polymers for the preparation of membranes with different mechanism of selectivity (diffusion, sorption or affinity). In other cases, the polymerization of specific monomers in the presence of an inducer for chirality or one-handed helical conformation has been exploited for the preparation of achiral polymers that retain the ''chiral memory'' after the removal of the chiral template and are able to display some degree of enantioselectivity in the permeation process . Scheme 1.3 Brush-type (a) and polysaccharide-based (b) chiral stationary phases for liquid-chromatography sacrificing selectivity. Many brush-type stationary phases with a chiral selector covalently bonded on silica are available and p-p interactions between p-donor and p-acceptor aromatic rings of analyte and CSP as well as hydrogen bonding and dipolar interactions are mainly involved in the differential retention behaviour of two enantiomers that are then eluted from the column at different times. Additional inclusion phenomena occur when chiral macrocycles, as native or derivatized cyclodextrins, or chiral polymers, as functionalised cellulose or amylose that provide a chiral helical environment, are coated or covalently immobilised on silica support (Scheme 1.3). Polysaccharide-based CSPs coupled with different elution modes [29-31] today account for over 90% of the reported enantioselective separations  and their high cost is partially balanced by the automation of the chromatographic process. 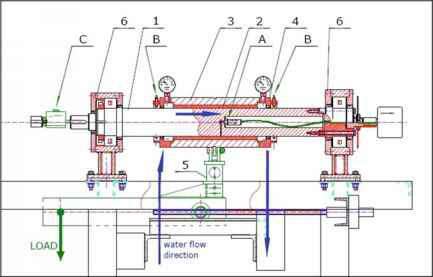 section ring, containing one or more column for section, with two inlet streams (feed and eluent) and two outlets streams (extract and raffinate) directed in alternating order to and from the columns' loop. 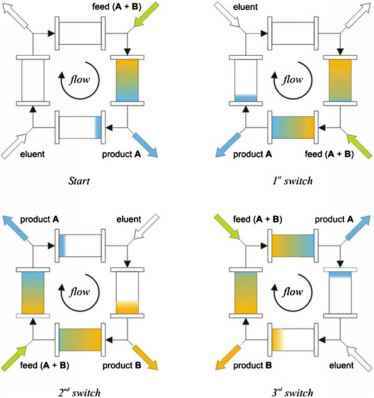 The countercurrent movement of the liquid mobile phase with respect to the stationary phase is then simulated shifting at regular time intervals the position of the ports by one column in the direction of the solvent flow (Fig. 1.2). Biocatalysed resolutions in which a racemic substrate reacts under enzymatic control constitute another important method for the preparation of enantiopure compounds. Although in most cases an aqueous reaction medium is strictly required in order to preserve the native conformations essential for the activity of the biological catalysts, the Klibanov's group firstly demonstrated that some enzymes save their catalytically active conformations even if they are surrounded by a water monolayer in a bulk organic solvent and in this context polar solvents are less suitable than the hydrophobic ones because they tend to strip out the water from the enzyme surface . Using nearly dry organic solvents some advantages come from better solubility of substrates, enhanced enzyme stability and the possibility to recover the enzyme by simple filtration and carry out reactions that are impossible in water because of kinetic or thermodynamic restrictions. Hydrolytic enzymes as lipases and esterases are widely employed in organic synthesis [35-37] due to their large substrate acceptance, stability in both aqueous and organic solvent, relatively low cost and the possibility to modulate their stereoselectivity and/or substrate specificity by changing the solvent  or by using suitable additives. In the cellular aqueous medium they catalyze the hydrolysis of esters through the formation of an acyl-enzyme intermediate that undergoes the nucleophilic attack of water to give the free acids and alcohols. Instead, in organic solvent the cleavage of the acyl-enzyme intermediate by other nucleophiles becomes feasible due to the low water content and results in the synthesis of new esters or amides. Because of the intrinsic chirality of enzymes, the enantiomers of a racemic substrate can be transformed with different reaction rate according their tendency to be accommodated into the catalytic site and the overall process is described as a kinetic resolution. The enzyme enantioselectivity (E = kR/kS) is expressed by the ratio of the reaction rates for the two enantiomers and a model for the rationalization of the R-stereopreference observed for the majority of lipases has been also developed [39, 40]. Varying the experimental conditions lipase-catalyzed stereoselective reactions have been designed for the resolution of several racemic esters, alcohols or amines and vinyl esters or activated trifluoroethylesters are usually chosen as acyl donors in order to suppress the reversibility of enzymatic processes. In an ideal case (E > 200) for a lipase showing R-stereopreference, the biocatalysed acety-lation of a racemic alcohol (Scheme 1.4b) should afford the R-acetate and the unreacted S-alcohols, both compounds in >95% ee and theoretical 50% yield. At lower E value, the enantiomeric profile of the enzymatic reaction is strongly dependent by the conversion according Sih's equations  but the product and the substrate can be obtained in high optical purity below or beyond 50% of substrate conversion, respectively. Scheme 1.4 Racemic resolutions through lipase-catalysed reaction in organic solvents increased by adding a suitable hydrogen source and p-chlorophenylacetate was proven the best acyl donor. are two selected examples of recent application of this strategy for the synthesis of biological molecules (Scheme 1.6). The major drawback of chiral pool synthesis is connected with the availability in most cases of a single enantiomer of the starting material, the other one being often prohibitively expensive or unavailable. Despite of this problem and the presence of other methods for the access to chiral compounds the chiral pool synthesis is still valuably considered whenever feasible.